Children’s book illustrator Patrice Barton begins a picture book with a spiral ruled notebook that she soon fills with ideas, tactics and to-do checklists related to the project. It’s almost as if the words come first. The drawings, which for her are a series of tireless explorations only a tiny fraction of which make it to the book, spring forth after she’s worked out the notions, notations and marching orders for herself. In the previous post she told how she assembled her scraps of sketches on tracing paper to develop finals for Sweet Moon Baby by Karen Henry Clark (Knopf Books for Young Readers.) This time she reveals the earliest stages of her artwork for the picture book Mine! by well-known children’s author Shutta Crum. Released in June, Mine! is Patty’s second book for Knopf. Patty’s work for Mine! is being included in the Society of Illustrators Original Art Exhibit, 2011! At the end of our video interview minutes before class time at the Art School of the Austin Museum of Art Patty walked through the F&G’s for her third Knopf title, Rosie Sprout’s Time to Shine by Knopf editor Allison Wortche — due for publication in December. Here are sophisticated first graders, not babies or toddlers. With their glances, gestures and placements on the pages, Patty orchestrates a very funny elementary school drama of evil plans, remorse and redemption. Watching her interpret Wortche’s scenes as text gives us insight into how she thinks about her characters and re-constructs a story in its most telling images. 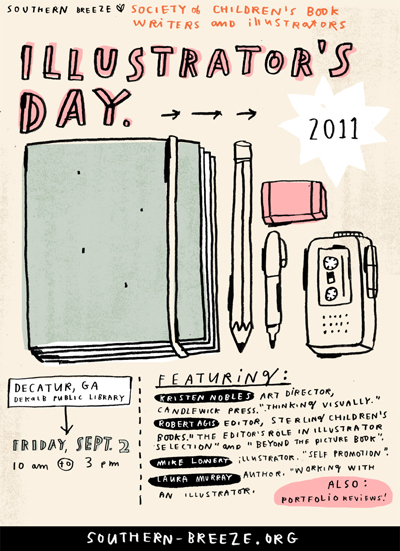 Southern Breeze Society of Children’s BookWriters and Illustrators Illustrators Day – Friday, September 2 on the lower floor of the DeKalb County Public Library, Decatur, Georgia. Kristen Nobles, art director for Candlewick Press will give the keynote, Thinking Visually: The Illustrator as Illuminator. Michael Austiin will mentor 12 illustrators (first come, first serve) with an assigned project before the workshop. Also featured will be Robert Agis, Editor from Sterling Children’s Books, Illustrator Mike Lowery speaking on Self Promotion and Sketchbook and picture book author Laura Murray. There will also be a portfolio review. The Annual SCBWI Eastern PA Illustrator Day, Saturday, September 24 is a one day intensive at the University of Pennsylvania Golkin Room, at the Perelman Quadrangle featuring Clarion Books senior designer Kerry Martin. Kerry’s workshop involves an exciting pre-workshop home assignment. You’ll receive the assignment when you register. He and illustrators agent Kirsten Hall with The Bright Agency will be doing portfolio reviews. Storytelling in the Digital Age – Embrace the Change – Saturday, October 8 at St. Edward’s University, Austin Texas. Austin SCBWI symposium on the fast-evolving e-publishing scene features presentations by professionals who are doing it in the Austin area and the key address, via Skype by SCBWI Executive Director Lin Oliver, SCBWI and Digital Storytelling. Traditions and Technology: The Transformation of Children’s Publishing is the theme of this year’s North Central/North Texas SCBWI regional conference, October 7-8 at the Fielder Road Baptist Church in Arlington, Texas. The Saturday event features Simon and Schuster art director Laurent Linn, a line up of editors from Scholastic and Random House, an agent from Andrea Brown and authors Bruce Coville and Tammi Sauer. School Library Journal asks Brian Selznick about many things, including his new illustrated children’s novel Wonderstruck (Scholastic) and the Martin Scorcese movie adaptation of his Caldecott Medal-winning The Invention of Hugo Cabret. Read the story here. 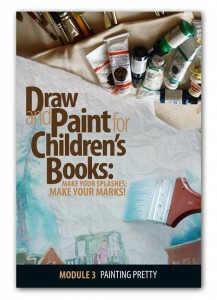 An online course on illustrating children’s books, Make Your Splashes – Make Your Marks! 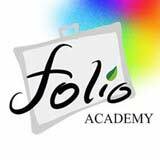 shows you how to draw nearly anything, unlock beautiful design and color in your art and what to do, step by step when you land that assignment to illustrate a story for a book, magazine or digital product. You can read more about the course here. This entry was posted in art instruction, children's book art, children's book illustration, children's book illustrators, children's book publishing, drawing and painting, Pictures worth a thousand words and tagged Austin SCBWI, Brian Selznick, Candlewick Press, Children's book illustration, children's book illustrator. Patrice Barton, Knopf Books for Young Readers, Mark Mitchell, SCBWI, Shutta Crum. Bookmark the permalink. Wow, thanks for all of this, Mark! I’m kicking myself for not paying attention to the Southern Breeze Illustrators Day — I happened to be in Decatur the next day for the Decatur Book Festival; why didn’t I think to check on SCBWI happenings in the area? Because how great it would have been to attend both. 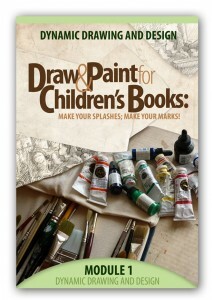 Nonetheless, this is a terrific post chock-full of great stuff for illustrators. Thank you! Thank you so much, Ruth! Your article is so good I’ve bookmarked it already.